Israeli Internal Security Agency Shin Bet has the power to reject appointment or dismiss Arab teachers at Arab schools, Israeli Ynet News has reported. According to Days of Palestine, a former official at the Israeli Ministry of Education, Emmanuel Koplovich, told Ynet News that Shin Bet has rejected the appointment of many qualified teachers. The news website revealed that Shin Bet targeted the Arab teachers in cooperation with the ministry. Teachers did not know why they were dismissed or not accepted for a position. It also revealed that some of the teachers were not involved in any political activities, but were rejected because of the political activities of one of their relatives. The Director of Adalah Centre for Arab Minority Rights in Israel, Hassan Jabareen, said that Shin Bet’s interference in the recruitment and dismissal of Arab teachers and head teachers has been known for a long time in the Arab community. 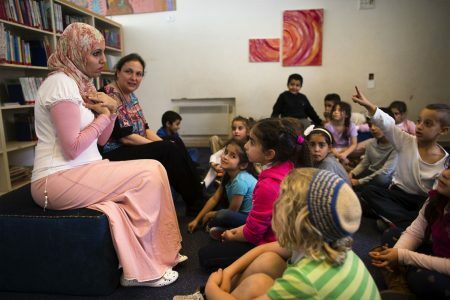 Such actions reiterates the hostility of the Israeli Education Ministry towards the country’s Arab citizens, who make up a fifth of the population.